Removal ProcedureRemove the battery tray. Refer toBattery Tray Replacement. Remove the oil cooler inlet and outlet hoses from theretainer on the control valve body cover.Raise and support the vehicle. Refer toLifting and Jacking the Vehicle.Remove the front transmission mount. 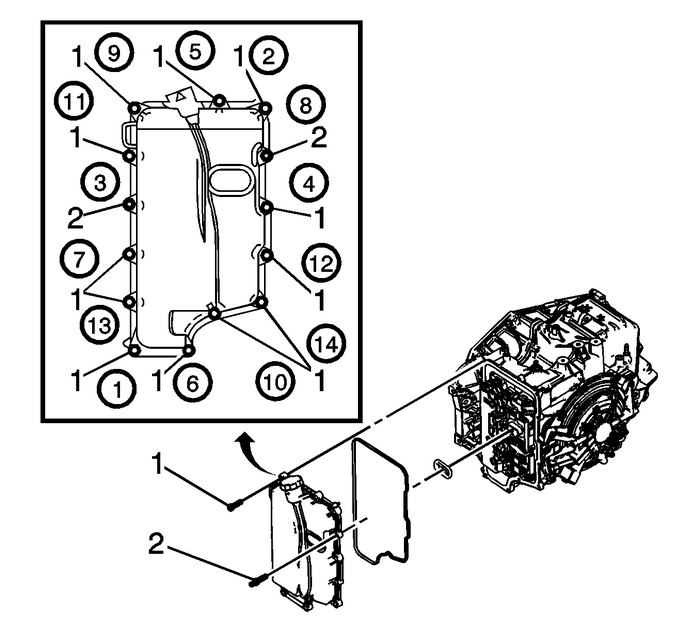 Refer toTransmission Front Mount Replacement.Remove the lower nuts from the left transmission mount. RefertoTransmission Mount Replacement - Left Side.Drain the transmission. 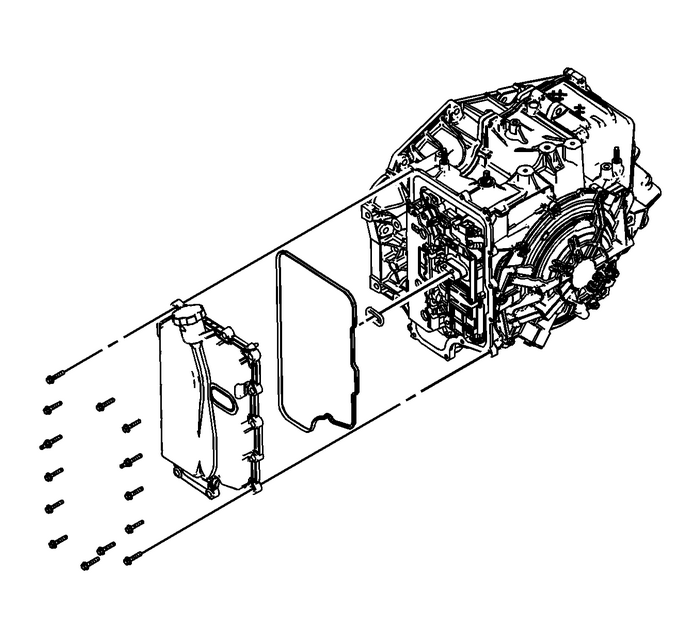 Refer toTransmission Fluid Drain and Fill. Disconnect the control valve body transmission control module(TCM) electrical connector-(1). Remove the 2-control valve body cover studs M6 x30.Remove the 12-control valve body cover bolts M6 x30.Support the transmission with a transmission jack.Using the transmission jack raise the transmission to gainclearance for removal of the control valve body cover.Remove the control valve body cover.Remove the control valve body cover gasket. Note:The holes in the control valve body cover wiring connectorhole seal must face toward the control solenoid valve assembly. Ifthe holes face toward the valve body cover, there is a potentialfor a leak around the seal. 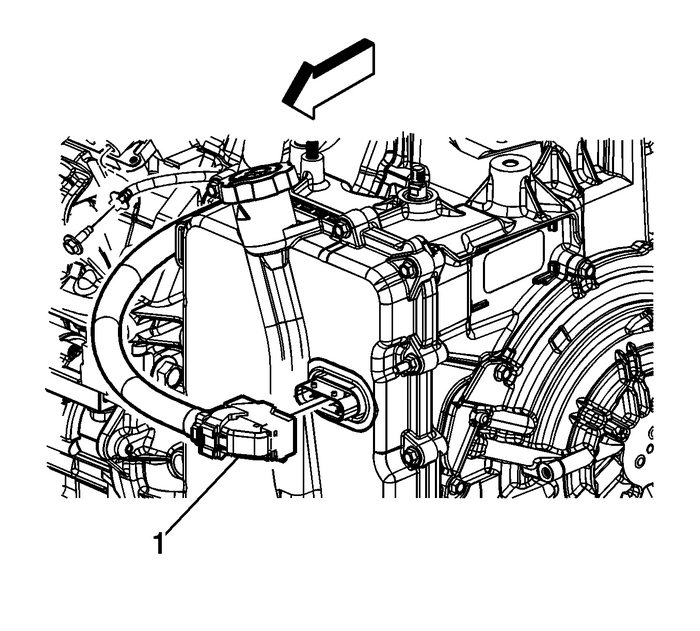 Install the control valve body cover wiring connector holeseal.Install the control valve body cover gasket to the controlvalve body cover.Install the control valve body cover.Lower the transmission and remove the transmissionjack. Note:Install all control valve body cover bolts and studs by handthen torque all bolts and studs in sequence. Install the 12-control valve body coverbolts-(1) M6 x 30 and tighten the bolts in sequence to12-Y(106-lb-in).Install the 2-control valve body coverstuds-(2) M6 x 30 and tighten the studs in sequence to12-Y(106-lb-in). Connect the control valve body TCM electricalconnector-(1).Install the lower nuts to the left transmission mount. RefertoTransmission Mount Replacement - Left Side.Install the front transmission mount. Refer toTransmission Front Mount Replacement.Lower the vehicle. Install the oil cooler inlet and outlet hoses to the retaineron the control valve body cover.Install the battery tray. Refer toBattery Tray Replacement.Fill the transmission. 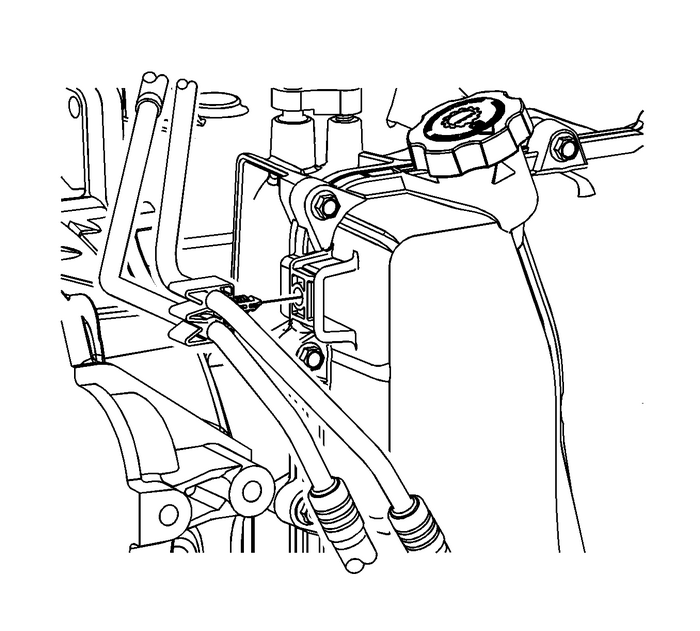 Refer toTransmission Fluid Drain and Fill.Check for leaks.